TriFive related Ebay auctions and Craigs List, Links to other sale sites Post a link to a current eBay auction or Craig's List for any TriFive related content. Many would consider changing a 210 sport coupe into a Bel Air as a travesty, since 210 sport coupes are relatively rare and desirable. Thing is, the Bel Air conversion is incomplete and botched. The 210 quarter panel/door spear is still in place, just that Bel Air emblems were put on the quarter panels. The front fender/door spears are not correct, the front fender spear doesn't go as far forward as a real Bel Air one. Must be a low quality repro. I'll bet there are other things that could be picked at. All this stuff makes one wonder about anything else on the car. It's still a 210 model (by VIN) regardless of the trim that is added to it. 1974 Chevy Nova 2 door- 2nd owner. 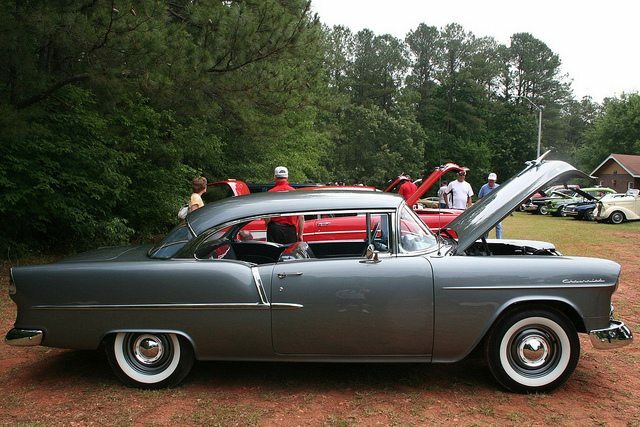 1956 Chevy 2 door Sedan 210. Actually, I would have preferred the 210 Sportscoupe...Sometime less is more, IMHO.